Santa Claus has not always appeared the way we think of him today. The first well-known gift-giver was a true person--St. Nicholas. He lived in Myra (today we know it as Turkey) in about 300A.D. Born an only child of a wealthy family, he was orphaned at an early age when both parents died of the plague. He grew up in a monastery, and at the age of 17 became one of the youngest priests ever. Some years later Nicholas became a bishop--hence the bishop's hat or miter, long flowing gown, white beard and red cape. After his death he was elevated to sainthood. Eventually the Catholic Church started celebrating Christmas and St. Nicholas was incorporated into the season. Many stories are told of his generosity as he gave his wealth away in the form of gifts to those in need, especially children. Legends tell of him either dropping bags of gold down chimneys or throwing the bags through the windows where they landed in the stockings hung from the fireplace to dry. There was a very rich man in the city of Mora who lost all his wealth. He had three daughters who had passed the age of marriage, and could not marry them because of his poverty. Satan caused the man to think that he should make his daughters live in sin so that they might get their food by means of fornication. God revealed to St. Nicholas the thoughts that were in this man's head. St. Nicholas took one hundred dinars of his father's money and tied it up in a sack, and during the night he threw the money into the window of that man's house. When the man found the gold, he was astonished and rejoiced exceeding and was able to give his eldest daughter away in marriage. During another night the saint threw another hundred dinars into the man's house and the man was able to give his second daughter away in marriage. The man wanted to know who this charitable person was. The third time when the saint threw the gold into the house, the man was watching and immediately when he felt the drop of the sack, he went out of his house running to see who was throwing the gold to him. He found the kind bishop St. Nicholas and the man bowed down at his feet and paid him great homage and thanked him because he saved his daughters from poverty and from a life of sin. The saint refused to accept any thanks and asked them to thank the Lord who put this thought in his heart. St. Nicholas drove out the devil and his angels from people; he healed many sick people, and blessed little bread to satisfy many people. On December 6th in some countries, "The Feast of Saint Nicholas" is held marking the time of his death. Children look forward to receiving presents from him if they have been good, but are punished instead if they have been bad. Eventually the Catholic Church started celebrating Christmas and St. Nicholas was incorporated into the season. The Christians moved the festival to December 24th to bring the story in line with their beliefs. Thus, Saint Nicholas was said to give out his presents to children on December 24th not December 6th. When the Reformation took place, the new Protestants no longer desired St. Nicholas as their gift-giver as he was too closely tied to the Catholic Church. Therefore, each country or region developed their own gift-giver. In France he was known as Pere Noel. In England he was Father Christmas (always depicted with sprigs of holly, ivy or mistletoe). Germany knew him as Weihnachtsmann (Christmas man). When the communists took over in Russia and outlawed Christianity, the Russians began to call him Grandfather Frost, who wore blue instead of the traditional red. To the Dutch, he was Sinterklaas (which eventually was mispronounced in America and became Santa Claus). These Santa’s were arrayed in every color of the rainbow--sometimes even in black. But they all had long white beards and carried gifts for the children. On December 23rd, 1823, the author Clement Clarke Moore published his poem "Account of a Visit from St. Nicholas" in the New York Sentinel. He described St. Nicholas as "chubby and plump, a right jolly old elf". 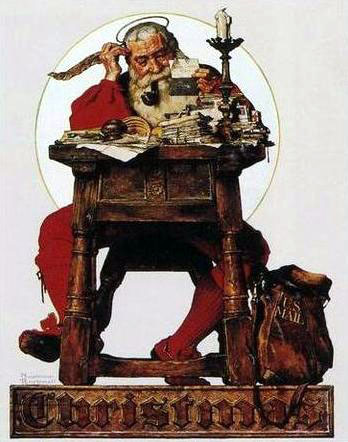 His work later became better known as “’Twas the night before Christmas”. Forty years later, Thomas Nast, political cartoonist, created a different illustration each year of Santa for the cover of Harper's Weekly. His Santa was a plump, jolly old fellow with a white beard and smoking a long stemmed pipe. Nast also disclosed the whereabouts of Santa Claus’ domicile: The North Pole. During the Civil War, President Abraham Lincoln asked Nast to do an illustration showing Santa with the Union troops. Many historians say this was one of the most demoralizing moments for the Confederate army, seeing Santa side with the North. Finally, from 1931 to 1964, Haddon Sundblom created a new Santa each Christmas for Coca-Cola advertisements that appeared worldwide on the back covers of Post and National Geographic magazines. He developed Thomas Nast’s image of Santa Claus into a more jovial and plumper character with a generous aspect. This is the Santa we know and love today with a red suit trimmed with white fur, leather boots and belt, long white beard and a pack of toys slung onto his back. This image has been used extensively since and is still used by Coca-Cola in their seasonal advertising to this date.